The stabilization of heavy metals (zinc and chromium) and the degradation of organic pollutants during supercritical water (SCW) and supercritical water oxidation (SCWO) treatment of electroplating sludge (EPS) with a high iron content were studied. Experiments were performed in a batch reactor at temperatures in the range from 623.15 to 823.15 K with an oxygen coefficient (OE) from 0 to 2.0, a reaction time of 7 min and pressure of 25 MPa to examine the effect of the operation conditions. Chemical oxygen demand (COD) and total organic carbon (TOC) in raw sludge and liquid products under different reaction conditions were detected. 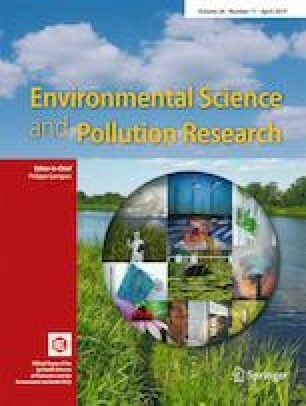 The results indicated that more organic pollutant degradation occurred under supercritical conditions than in subcritical water. Additionally, as the temperature and amount of oxidant increased, the organic pollutant removal rate increased. In addition, the Zn and Cr removal efficiency from sludge was more than 98% under all conditions. Temperatures under 773.15 K had a positive effect, whereas the oxygen ratio was more significant than the other factors above 773.15 K. Furthermore, leaching toxicity tests of the heavy metals in solid products were conducted based on the toxicity characteristic leaching procedure (TCLP). All heavy metals showed greatly reduced leaching toxicity due to their stabilization. The Zn in the EPS is more easily converted into a solid product after SCWO treatment; however, Cr is more difficult to leach from the solid product. Oxides of iron, zinc, and chromium were detected by X-ray diffraction and an electron probe microanalyzer, and the yield of the oxides increased with increasing temperature and oxidant amount. Using the obtained data and analysis results, the effect of Fe on the stabilization of Zn and Cr was studied. The online version of this article ( https://doi.org/10.1007/s11356-019-04897-6) contains supplementary material, which is available to authorized users. This project was supported by the National Natural Science Foundation of China (No. 41673105), the BaGui Scholars Program Foundation (No. 2014BGXZGX03), and the Youth Fund Project of Guangxi Natural Science Foundation (No. 2016GXNSFBA380239).